…… because this evening I went out all by myself to a spit-and-sawdust neighbourhood restaurant. I’d had to leave poor old Malcolm tucked up on his mattress to catch up on lost sleep. Food was of no interest to him. No tourists here. No English menu. But I managed to order spiced octopus stew, and later to say it was delicious and ask for the bill. I tackled my six kinds of kimchee, sizzling fishy broth, a pot of rice and the octopus with no kind of panache and almost certainly appalling table manners. My fellow diners – and the waitress – cut me lots of slack. Here’s a photo of my kimchee selection. Tomorrow will be easier. Emily arrives. Hooray! 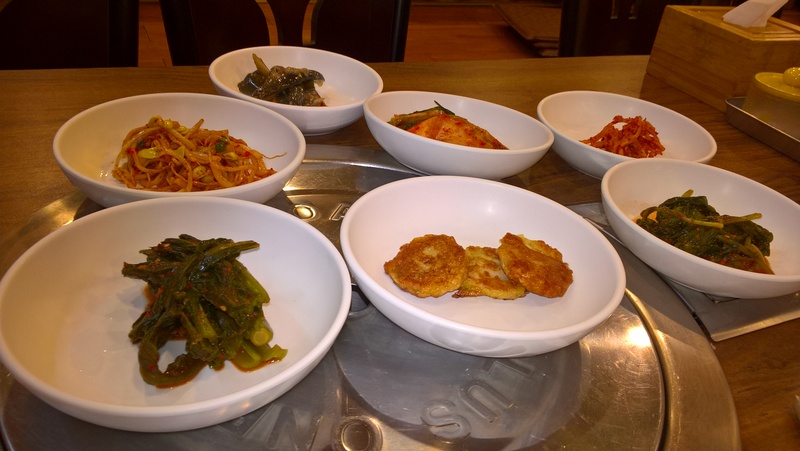 Author margaret21Posted on September 13, 2016 October 17, 2016 Categories South KoreaTags eating out, food, kimchee, Seoul17 Comments on Feeling rather proud…..
We’re almost packed for Korea. We’ve remembered to pack the Marmite for Emily. My friend Penny’s packed and left for France, where she’s staying at Maison Grillou with Kalba, happily exiled from England. She’s remembered to pack the Marmite too. Two jars – large. What is it about us Brits? We can live abroad for years and years, and learn to do without Proper Tea (very easy for me, that one), baked beans on toast (even easier), and Bird’s custard powder (easier still). But deprive us of our Marmite, and we go into a steady decline. It’s not as if we all like it. Marmite themselves never try to convert anyone in their advertising. They know full well we either love it or loathe it, and there’s no point whatsoever in trying to persuade a Marmite-hater to give it another go. What is clear though is that you do have to be British to love it. I’ve never spoken to anyone born outside the UK who could understand our love for this peculiar, salty yeast extract, a by-product of the brewing industry. What’s your take on it? Incredibly, there’s even a board game to help you decide. I don’t need to play. I love it. Marmite – the board game. I love allotments. I love those productive shanty towns that you often see at the side of housing estates, edging railway lines, or just beyond the local sewage works. I relish the make-do-and-mend of gardeners’ huts fashioned from lengths-of-wood-and-bits-and-bobs, set alongside neat little cabins bought from B&Q. I enjoy contrasting planting styles. Here – neat meticulous rows of cabbages, beets, carrots and potatoes: there – less organised plots with discarded tyres serving as planters for courgettes and beans set among a hotchpotch of gooseberry and redcurrant bushes. I love the camaraderie of the allotment community – the willingness to share hard-earned knowledge, tips, seeds, cuttings, and even muscle-power. So much more fun that a solitary afternoon battling with weeds. In Harrogate, I had an allotment. I was the disorganised type, always running from behind, because work and family life got in the way. In France, our vegetable garden was too far away to get the attention it deserved. Here in North Stainley, there are no allotments …..
A few years ago, some villagers decided to initiate an allotment project. They worked hard, but progress was slow. Surrounded by countryside, even identifying a suitable site proved difficult. I heard about the plans and asked to become involved just as the group reached a turning point. The local landowner has offered to rent out a plot large enough for ten full-sized allotments. An allotment is ten poles (or rods or perches) large. That’s the size of a doubles tennis court. We reckon most people will be happy with a half plot. Twenty allotments then. So last Saturday we went to look at the land. It’s a large chunk at the end of a productive field, and it’s currently rather wet, like just about every other field in England. Promising though. Six years ago, this was a field as unpromising as ours. There’s hope, then. Market day there, market day here….. Dried fruit for the Christmas cooking. One of the bread stalls ar St. Girons. A busy Saturday in St. Girons. We’ve just come back from a Saturday morning strolling round Richmond market. It’s a pity for Richmond that our most recent Saturday-strolling-round-market experiences date from our days in the Ariège. The Saturday morning market in Saint Girons is an incomparable experience which Richmond couldn’t match. Saint Girons has fewer than 7000 residents, but it’s the administrative centre of the Couserans, and the centre of gravity not only for its own inhabitants, but for townspeople, villagers and farmers for miles around. Saturday is the day they come to stock up on fresh fruits and vegetables, charcuterie, cheeses, dried fruits, hardware and haberdashery, plants for the potager, and to link up with friends and neighbours over a coffee or a beer in a local bar. Saturday is a day when they might themselves be stallholders. Among the joys of the market is the pleasure of finding small stalls selling just a small selection of say, goats’ cheeses, produced that very week by a ‘petit producteur’, or asparagus picked no more than 24 hours before, and only available for a few short weeks in April or early May, or home-produced charcuterie, or mushrooms and fungi foraged from the woodlands and meadows round and about. There’ll usually be a crowd surrounding these specialised stalls, which may not be there every week, or in every season, because they can only put in an appearance when they have enough good things to sell. And the market sprawls between two squares, along the banks of the river, and up a couple of other streets. You won’t get away in a hurry. A rather special cheese van. Author margaret21Posted on October 18, 2014 Categories Ariège, YorkshireTags Ariège, food, markets, Saint Girons, shopping14 Comments on Market day there, market day here…..
Little tells me more forcefully than a walk through the woods at this time of year that we are back in England. Instead of crisp brown leaves underfoot, from the Autumn before and the Autumn before that, there are narrow damp paths through the rich carpet of undergrowth. And that smell! As you walk, inevitably bruising the leaves that crowd onto your path, you’ll smell the pungent notes of garlic: because those leaves, topped off by a mass of star-shaped flowers, are wild garlic (or ransoms, ramps or bear’s garlic), and they’re unknown in the part of France where we lived. In among, competing for the sun which dapples in through the tree canopy, are bluebells. At the moment, they’re largely still in bud but give them a few days and they too will carpet the woodland floor in a shimmering violet-blue. And these are our English bluebells. They’re more graceful than the upright, paler Spanish bluebells that we sometimes saw in France. The blogosphere is crammed with suggestions for making use of the garlic, among the earliest greenstuffs available after the winter months. Here‘s what David Lebovitz suggests. Well, I rely on David to supply ideas for delicious grub, so off into the woods I went for garlic leaves. I was careful to pick only leaves, rather than yank up entire plants with their tiny bulbs, so that they would grow again next year, though a few bulbs crept into my harvest despite my efforts. I’d taken my haul in any case from the woodland edge, as the garlic plants made an escape bid into nearby fields. And here’s the resulting pasta dish. Frankly, we were a little disappointed. It wasn’t the most interesting dish we’d ever eaten. But I could see the charm of these leaves to those who’d struggled through the winter months on a diet of beans, swede, and the odd bit of salted pork. Wild garlic has a bright, ‘green’ flavour, mildly garlicky of course, and I will try it again, maybe substituting it for spinach in a tart with walnuts and a sharp cheese for instance. I always enjoy an excuse to forage for food. Wild garlic pasta, David Lebovitz style. Pop along to your local butcher round here, and you’ll find pale yellow slabs of something that rather resembles polenta on sale. It’s millas. And it resembles polenta because they’re first cousins. Both are made of corn meal cooked into a kind of porridge. Whereas Italians favour polenta as a base for various savoury dishes, millas is usually served sweet. And today, we were invited, together with the rest of the Commission du Patrimoine here in Laroque to watch it being made, before sitting down to a millas tea party. Our hosts were Paul and Aline Garrigue, whose house is a fascinating museum to traditional Ariègeois life, and filled with artefacts from the not-at-all-distant past. Who’d have guessed that the fearsome collar six inches wide and covered with spikes used to be worn by local dogs to prevent their being savaged in the neck by wolves? Which of us still has a bread oven built into the side of the fire-place? By early afternoon, water was set to come to the boil in a huge copper pan set over an open fire. Various expert fire-makers set to with the bellows, and soon the water was ready for other ingredients. Getting the fire blazing with bellows. Milk first. Then cornmeal, slowly and gently dropped in by hand so that it didn’t go all lumpy. Then more cornmeal. A small amount of flour. Salt. Duck fat. Vanilla sugar. A decent slug of eau de vie. And all the while, Paul stirred and stirred, with his toudaille. You could have one of your own if you’d like. Next year, on Twelfth Night, take your Christmas tree, and cut away almost all its branches, apart from maybe six or seven towards the bottom. Trim these so they’re just a few inches long. Strip the bark off and dry the whole thing out. And there you have it. A multi-pronged stirring instrument that does the job of a balloon whisk, but on a much larger scale. You can just about spot the ‘prongs’ of the toudaille. And still Paul stirred. He tasted. Nope, not thick enough. He stirred some more. Finally, he pronounced it just right. A couple of muscular types staggered off with this huge vat of the pale porridgey stuff, and …. tipped it out over a trestle table, covered with a flour-sprinkled cloth. Then the table itself was tipped, this way and that, so that the millas flowed and settled into a thickish sheet. And there it stayed. It’ll probably still be there till tomorrow morning. Once it’s good and cold, it can be cut up into slices and …. on to the next stage. The un-scraped out pan was put back on the fire. Eau de vie, plenty of it, was added. Paul set a match to it, and it flamed in the manner of a good old British Christmas pudding. We were all issued with a teaspoon, and had a go scraping the pan. Malcolm and I couldn’t quite manage the enthusiasm of the rest, but it was pleasant enough. Then it was time for tea . It was a ‘Here’s one I made earlier’ moment, with yesterday’s millas chilled then grilled, to be served with jam, honey, whatever you fancy. We decided once more that you have to be Ariègeois to appreciate it. It doesn’t really taste of a great deal to us. We had assumed it was a cheap and filling everyday food once upon a time. But it was particularly associated with this time of year, when families killed their pigs and spent time feasting, cooking and preserving all the meat the pig provides. Another version of millas, less common now, uses pig’s blood, in much the same way as in a black pudding. Nowadays you’ll find millas at every time of year, but in memory of its associations with the pig, it’s the butcher’s shop where you’ll need to look. We weren’t converted to millas eating, but watching the stuff being made, and sharing the moment with people who had so much to tell us about this traditional treat was a wonderful way to spend a wet Saturday afternoon. Nothing to do with millas. A charming detail from the embroidered smoke screen above the chimney breast. Author margaret21Posted on February 15, 2014 February 15, 2014 Categories Ariège, Food & Cooking, Laroque d'OlmesTags Ariège, food8 Comments on Millas. National treasure?